Top of the Line bark control collar is high quality bark collar with 7 levels of correction that automatically adjusts to your dog temperament. The fully rechargeable, waterproof bark collar is best for medium to large dogs, of all temperament types, even stubborn breeds. With 3 different modes of operation, you can find the best bark control option for your dog. The best of the best in terms of Electric Dog shock Collars!! Train your dog to stop excessive barking easily and painlessly. The Pet Trainer's new Waterproof Rechargeable Anti Bark Collar for Dogs offers perfect bark technology. The bark control collar is activated by a vibration sensor and microphone, this prevents unintentional corrections. 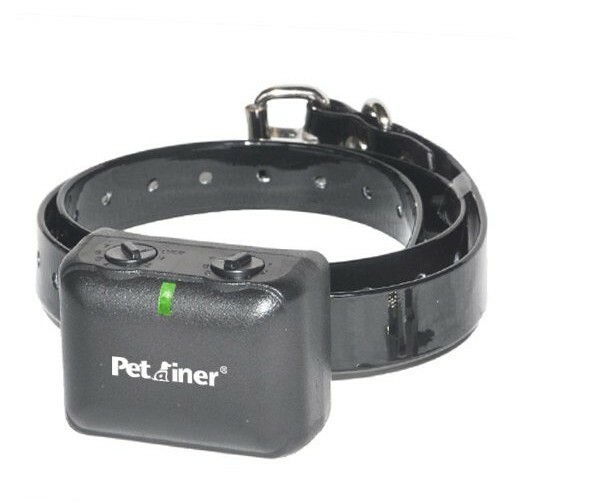 It also ensures that the bark collar will only activate if the dog wearing the bark control collar starts barking or making other nuisance level noise, ensuring your dog is never confused by a correction occurring accidentally. -. Size approximately : 55 x 40 x 28 mm. The circumference of the collar is adjustable, and the longest circumference is about 85cm, and the shortest is about 18cm, please check if this is suitable for your dog! Use the test light LED - provided. Attach the light to the metal probes, and use a pen or clip to scratch the test area, and the test light will flash. -. Ease-of-use, precision electronics and rechargeable function ensure training success! Waterproof Rechargeable Anti Bark for Dogs is an invaluable tool designed to curb nuisance-barking behavior through precise static corrections. Bark activated unit features stimulation control to deliver precise levels of correction to suit your dog's temperament. Simply turn dial to select the correction level. Pet-friendly electronic collar features surgical stainless steel contact points and antimicrobial plastic to protect your dog's skin. Compact and lightweight, is fully waterproof and is rechargeable for reliable, long lasting use. Built-in LED battery life indicator let's you know when it's time to use the included charger to optimize performance. Waterproof Rechargeable Anti Bark Collar with low to medium-stimulation output is great for small to medium-size dogs OR dogs with mild dispositions. This feature-loaded unit allows you to customize your training based on the temperament of your dog. Pager Mode delivers vibration-only corrections great for light barkers. Turn the dial to choose up to six progressive levels of static corrections to accommodate more active barkers. A warning vibration precedes each static correction. Built-in Bark Recognition ignores surrounding ambient noises to ensure correction only when your dog barks. Runs on included 2-hour rapid charge Lithium Polymer batteries. Start with the lowest level when first using your Waterproof Rechargeable Anti Bark Collar. If your dog continues to bark, gradually increase the intensity level. Your Waterproof Rechargeable Anti Bark Collar is a valuable training aid when used correctly. The Waterproof Rechargeable Anti Bark Collar uses Surgical Stainless Steel contact points and anti-microbial plastic to protect the dog's skin. Please observe your dog's neck everyday because it may rub as your dog moves, causing irritation if the collar is too loose. To prevent skin irritation, the collar should not be worn more than 8 hours at a time. Also, it is best to move the location of the contact points every few hours. To do this, take the collar off and then put it back on so that the contact points are in a different location on the neck. If skin irritation is found, wash the area and rinse with hydrogen peroxide. Apply an antibiotic ointment. Temporarily discontinue using the collar until the skin has healed. Proper collar strap tightness is extremely important. If the collar is too loose, it will not function properly and it may rub as the dog moves, causing irritation. The Waterproof Rechargeable Anti Bark Collar is intended for the sole purpose of preventing your dog from barking. Do not attempt to test the Waterproof Rechargeable Anti Bark Collars on humans or other animals. Dogs should be in good health during collar training. If you have any concerns, please consult with your trainer. Please remove the Waterproof Rechargeable Anti Bark Collar before playing with your dog. The activity may cause your dog to bark, which could lead him to associate playing with the static correction. The collar strap should be adjusted so that the contact points are held firmly against your dog's skin. Fasten the collar enough to allow one or two fingers to fit between the collar strap and your dog's neck. If the collar is too loose, electrical contact will be inconsistent and your corrections will be inconsistent also. Periodically wash the No Bark Collar with alcohol or detergent. Dry thoroughly after washing. Rechargeable with a built-in long lasting battery for consistent power supply. You can press the power button to turn off the receiver when it is not in use. Low battery indicator to determine when to charge the collar receiver. 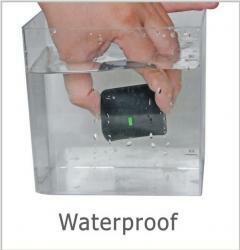 100% waterproof and submersible, you can use it in heavy rain condition or let you dog swim with the collar. This Waterproof Rechargeable Anti Bark Collar is currently the most advanced barking control device in the market. Unlike most auto anti bark collars in the market, the Waterproof Rechargeable Anti Bark Collar intelligently distinguishes excessive barking from normal behaviors such as occasional barking, scratching or running, and thereby prevents false triggering. For example, the first three excessive barks will trigger an ultrasonic function, if barks continue and get louder, a vibration will be issued. If barks get even louder and more frequent, a shock correction will be delivered. With continued barking, the shock correction will increase in intensity. If barks decrease, the corrections will be reduced automatically. -. Rechargeable with a built-in long lasting battery for consistent power supply. You can press the power button to turn off the receiver when it is not in use. Low battery indicator to determine when to charge the collar receiver. -. 100% waterproof and submersible, you can use it in heavy rain condition or let you dog swim with the collar. -. Long and short prongs for all coat types. -. Weatherproof collar with adjustable length from approx. 18 cm-51cm/7"-20". -. Receiver size: 6cmx3cmx2cm /2.3"x0.9"x0.7". 6. Receiver weight: approx. 1.6oz/45g. -. Will work for small and large dog. This sale includes: 1 collar receiver, 1 collar strap, 1 AC wall charger, 2 metal prongs and 1 test light, manual. Anti bark collar is waterproof and submersible up to 25ft. Effectively and humanely put an end to your dog's excessive barking today with the Waterproof Rechargeable Anti Bark Collar. Progressive Correction and a User-Selected Correction mode. Restrain your dog from barking excessively with consistent stimulation from this Waterproof Rechargeable Anti Bark Collar.